Apricots are closely related to peaches and nectarines, though its striking golden orange color gives apricot its distinct character. It has a unique sweet-tart taste that is favored by many people, and is used to flavor everything from candies to liquor. Fresh apricots are in season from May through August, though canned and dried forms can be bought throughout the year, said WHFoods.com. The fruit is small, with a soft peel and juicy flesh. The apricot originates from China, though it has been growing in Europe and the United States as well. It grows best in sunny climates. When selecting apricots, choose the fruits that have a richer color, more orange than yellow, and avoid those that seem pale. The fruit shouldn’t be too firm — a slightly soft feel means that the fruit has been tree-ripened, meaning that it has the best flavor. 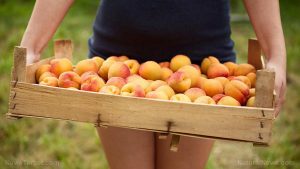 With its high fiber content, apricots can regulate bowel movements in patients who experience constipation, commonly recommended by doctors for patients who experience the problem, OrganicFacts.net said. The high fiber content also helps regulate cholesterol levels in the blood, which makes apricot great for the heart, protecting from common cardiovascular diseases including heart attacks, strokes, and clogged arteries. The fruit is also a great source of vitamin C, which protects the heart from free radical damage, and potassium, which manages blood pressure. The fruit is ideal for those who want to prevent osteoporosis or other bone degenerative conditions. It contains moderate to high amounts of calcium, phosphorous, manganese, iron, and copper — all of which are crucial for bone growth. Juice from the apricot can also a be an effective remedy against fever, as the combination of nutrients it provides can reduce inflammation and stimulate detoxification. Apricot has also been found to work against skin conditions such as eczema, itching and scabies, due to its antioxidant content as well as skin-friendly vitamin A. Eating enough apricot can also prevent premature skin aging, and maintain a clear complexion. With its unique sweet flavor, this fruit can be incorporated in many different dishes, and there are many ways to get creative with it. Some of the ways recommended by BonAppetit.com include adding slices to a salad, grilling it on a skewer along with chicken, turning it into a jam and eating with bread, and chopping up dried apricot to mix with granola. Of course, the best way to get all the benefits of this delicious fruit may be to just eat it as it is. Apricots are rich in fiber that help ease constipation. They contains all the components necessary for bone health. The fruit supports heart health with its vitamin C, potassium, and fiber content. It can be used as a remedy for fever, and is also useful in maintaining clear skin. Apricots have average antioxidant and detoxifying qualities.